I took a call from a lady some time ago. It’s the kind of story we hear all too often during the summer months. And it’s so easy to resolve with our fantastic range of made-to-measure Velux Shutters. To find out which shutter you need, simply pull your window open towards you and you will see a metal plate on the inside edge. Make note of the six digit code, eg GGL MO6 and we’ll have a plantation shutter to match. No measuring required! 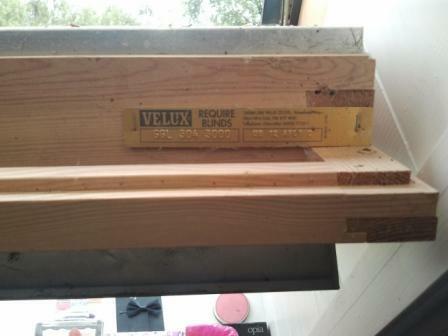 Your Velux shutter comes fully hinged and framed, so there’s no assembly required. Just lift onto the window and fix in place. We have numerous sizes in stock and they usually ship next day. The same lady very kindly sent us a photo of her new shutter. 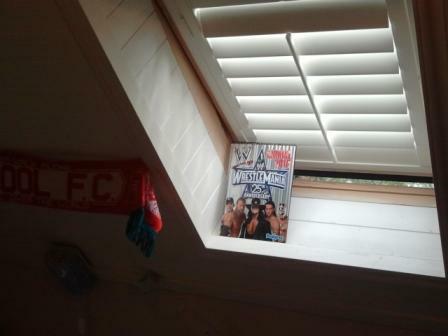 WWE annual not included. A longer nights sleep usually is! Simple as that. Problem solved. Sweet dreams from Shutterplus! The Velux GGL MO4 shutter pictured costs £99 (€130) inc. next day delivery. What’s the best wood for shutters? When it comes to choosing the best wood for your plantation shutters, there are 101 options available to you. But probably among the most popular are Basswood, Poplar, Cedar and MDF. Cedar is generally recognised as the best material for moveable louvre plantation shutters due to its lightweight nature and overall stability. However it is quite expensive and while beautiful in a stained or oiled finish, it really is a shame to paint over the beautiful grain. In my opinion, the next best timber is basswood. It also is lightweight, very stable, accepts a paint or stain finsh equally well, while it is very easy to machine. It’s also much more durable than cedar so will live up to the rough and tumble of everyday life. Most importantly of all, for such a good quality hardwood, it is not very expensive. Poplar is a good timber for shutters, however it is prone to sap bleeding around knots and this can sometimes manifest itself in small surface blemishes. MDF has it’s place as a cheaper alternative to solid wood, however I wouldn’t advise using it where bi-folding panels are required. It’s quite a heavy material and in wider openings will most certainly result in your panels sagging down towards the sill. To be honest it’s probably a material best suited to framing, skirtings, etc rather than products with moveable parts like shutters. Have you noticed how much brighter the mornings are at this time of year? If you’ve got small kids, you might not appreciate it that much as they tend to rise once daybreak arrives! Shutters are great for blocking out light in bedrooms. 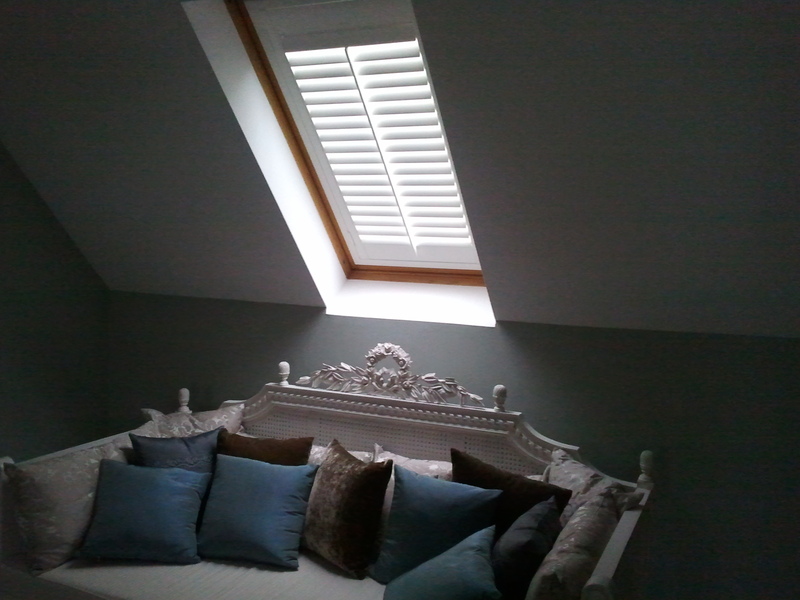 And if you’ve got a Velux window, our Velux Shutters are an ideal solution for bright bedrooms in the morning. They keep heat in during the winter; they keep the early morning light out during the summer; they’re usually available for next day delivery and best of all, they’re not as expensive as you might think. This shutter is fitted to a GGL MO6 window and costs just £99 / €119 plus delivery. Order your Velux Shutters securely in our online store. I took a call from a lady a few weeks back.